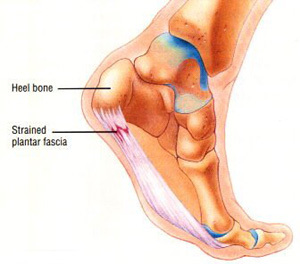 Foot & heel pain can be caused by a number of different conditions. But, the most common cause is wearing poor-fitting (or poorly designed) shoes. Whether or not you spend a great deal of time on your feet, it is important that your arches are properly supported, that the shoe is wide enough and that the heels are not too high. High-heeled pointy toed shoes cause more aches and pains than just the ones experienced in the feet. The knees, hips and back can suffer as well. On the other hand, well-fitting, well-designed shoes can resolve those problems, help to tone your legs and improve your posture. Below, you will see a list of conditions that will cause foot & heel pain, a brief description, other symptoms that are associated with the condition, if applicable, and the causes. Treatments for these conditions are listed here or on other pages of this website. Pain-relieving drugs are often taken, but they are accompanied by unwanted side effects, of both a short and long-term nature, including liver damage. The treatments listed here provide support, pain-relief and promote healing, without unwanted side effects.